My 4th book is now out. This book titled, "Have You Not Yet Received the Spirit? 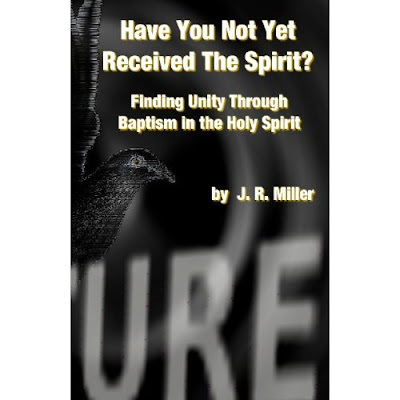 : Finding Unity Through Baptism in the Holy Spirit" is the second in a series related to the Holy Spirit. The first one "Promise of the Father" was a look at the early history of Pentecostalism in America an how it shaped the theology of Baptism of the Holy Spirit. This newest book is over 200 pages and takes a fresh look at what the Bible teaches on the Holy Spirit. Faith in Jesus must produce a natural love and generosity toward others and a desire for unity within the one Body of Christ. Sadly, this is not the condition of our Church today. There is much debate regarding the topic of Baptism in the Holy Spirit and it is unfortunate that people on all sides quickly dismiss others as evil or apostate. My hope is that this book will take this debate out of the hands of those who would divide the Church and place it back within the context of the whole Body of Christ. Read and discover the power of the Spirit and the bond of peace only He can provide. 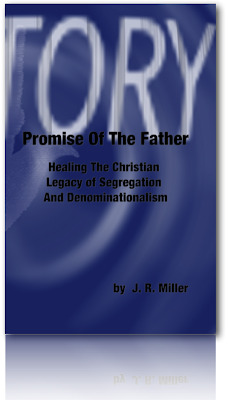 This book is titled, "Promise of the Father: Healing The Christian Legacy of Segregation and Denominationalism" and is the first in a series on the Baptism of the Holy Spirit. I began writing this book more than a decade ago when I was a MDiv student at Oral Robert's University. This first book looks at the historical development of the Pentecostal theology of Spirit Baptism and the many different views that exist in the church today. The book jacket description is as follows. Ambiguous and man-centered teaching regarding Baptism in the Holy Spirit have over the past hundred years served to feed the problems we face and have lent to the decay of Christ's Body. This book takes a critical look at the history of denominationalism, separates the fact from the fiction, and paves the way to healing the legacy of division in the church. I am also really pleased at how my cover art looks on the finished book. Pick up a copy today at Amazon.com. False tradition, arrogance, lust for power, greed, judgmentalism; these are the illnesses which plague God’s people and tear us apart. These vices disable the Body and render Her helpless to reach a broken world. We strive to give an account to all who ask us to explain the hope of our salvation, yet by our internal division we fall woefully short. If we can not stand together as Brother and Sister in Christ, if we can not hold fast to the hope of our salvation, how can we ever hope to fulfill the great commission of Christ to make disciples of all nations? Ambiguous and man-centered teaching regarding Baptism in the Holy Spirit have over the past hundred years served to feed the problems we face and have lent to the decay of Christ’s Body. More than 10 years ago, this blog began as a book. Now with the age of the internet, I feel the content is much more appropriate for an interactive forum like a blog. When I started writing this book (now blog), it was not for an academic study, written to sit on a shelf collecting dust. I do not write for the couch potato Christian unwilling to exercise his sprit and strip away the fat of false tradition. Rather I have undertaken the task of tearing down sacred cows of specious tradition so that we as a united Church might once again build up the true Temple of Christian worship. My prayer is that as we, the faithful Christ-followers, explore the Scriptures and our history to discern the truth regarding Christ’s Baptism in the Holy Spirit, and then a new era will begin. In the words of the great evangelist George Whitfield, “There is no running division upon truth; like a mathematical point, it will neither admit of subtraction nor addition: And as it is indivisible in its nature, there is no splitting the difference, where truth is concerned… For whatever is less than truth, cannot be truth; and whatever is more than true must be false.” By God’s grace, we may begin a new epoch that will serve to repair the breach of a century’s worth of bitterness and denominational rivalry and purify the wandering Bride of Christ. Years ago when I was a sophomore at Pennsylvania State University, I led a Bible study of young men from an eclectic background of denominations. One day they approached me about a subject of which I had little knowledge, the Baptism in the Holy Spirit. They had heard some conflicting teachings regarding this topic and had come to me for answers, answers I could not give. They asked if I would teach them what Baptism in the Holy Spirit meant and if it was something that accompanied salvation or something that came as a later part of the Christian life. My church background left me incapable of giving an immediate answer, but I determined to study the Bible and by the wisdom of God provide a satisfactory answer. Little did I know that many years later this topic would once again come to the forefront of controversy in my life and I would be confronted with the confounding traditions that mar the image of God in His people. As I began my studies at Oral Roberts University, I realized a depth to this topic my earlier studies of Scripture alone had not revealed. Through a variety of courses and numerous discussions with people from diverse backgrounds in the Pentecostal and Charismatic circles, I gained new insights into the subtle nuances of the Baptism in the Holy Spirit, its meaning, application and implication to my life. During my journey, I found that almost everyone I talked with had a very different view of what Spirit Baptism meant. It was this glaring lack of unity on such an important topic that caused me to see the greater need for study and reflection. “But wait,” some have asked, “why not let everyone believe what they want and define Baptism in the Holy Spirit however they choose? After all, if someone is happy and they love God, why not just let them continue on believing as they do?” Unfortunately, the attitude expressed in these questions is not the loving approach that Scripture demands of you or me. True love means that we must constantly strive to provide correction, reproof, and training in righteousness that together, as one people of God, we may prepare one another for every good work that God has ordained. If we as Christians are so divided that we can not deal openly and honestly with one another on subjects of controversy, then we have failed to be the expression of God’s love and grace. Through the shadow of my past experiences and in the light of God’s gracious love, I approach this topic, on this blog, not with the idea of proving an abstract argument, but keeping all viewpoints in mind, I hope to penetrate to the heart of the matter and bring clarity to this oft ambiguous and divisive topic. My prayer is that all who read this blog would have unity under the one Spirit who daily restores us into the image of Christ and the likeness of our Heavenly Father. All too often we use theology and the Bible to drive a wedge between ourselves and others who have different perspectives and backgrounds. To remain divided because of our uniqueness is a tragedy because it is never God’s desire that we create divisions within the one Body of Jesus Christ, rather let us read and work in prayer together to accomplish unity in our faith in God. Read more in my book..